I wasn’t going to blog this recipe for apple pie because it’s actually already on my blog. But I was so happy with how the crust turned out I thought it would be a shame not to capture it and share it here. And I was convince even further that I need to blog it, after all the nice comments and attention it received when I posted this picture on Instagram and Facebook. I’m usually not that creative with my pie crusts, and prefer to roll out a regular crust because that’s just what I’m used to. 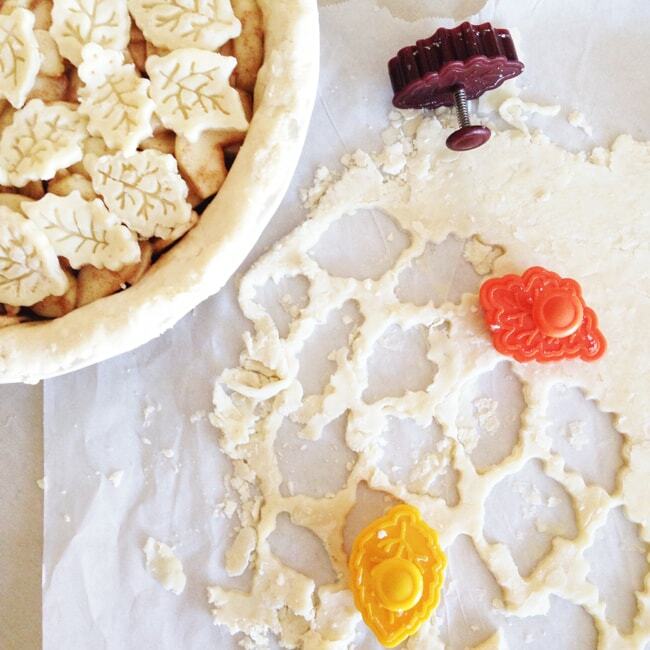 But I saw some pie crust stamps at Michaels and bought them thinking they would look nice on a fall pie. I have a lot of cute little kitchen gadgets that I will admit often just stay in the package, but I was inspired to try these stamps. And I love them. LOVE them. They were so easy to use. In fact, I found them almost easier than rolling out a crust onto my pie. I think this is because they are so much more forgiving. You stamp out the leaves and lay them out how ever you like on to the top of your pie. No skill involved…trust me…you can do this. SO easy, and makes such a beautiful pie. I’m in love with this pie. A lot of you were concerned about cutting into such a pretty pie, but don’t be. Just make someone else do it and don’t look! You’ll forget the trauma after your first bite…this pie is as delicious as it is pretty. You should make one. Then eat it warm with a big scoop of vanilla ice cream…heaven on a plate. Make the apple filling first. 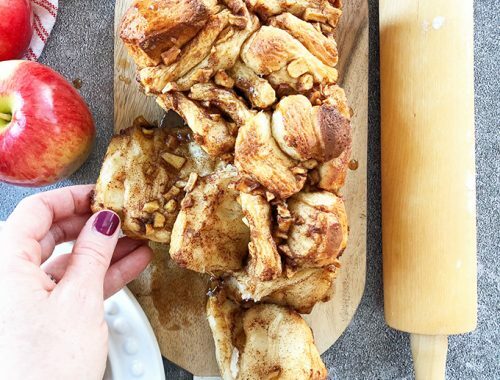 Combine the sliced apples, sugar, flour, cinnamon and salt. Set aside. Sprinkle in the water, 1 tsp or so at a time, mixing lightly with a fork. Don’t over mix or the crust will be tough. Press into a ball. Then split into 2 balls. It’s okay if the mixture is crumbly. In fact crumbly makes for a tender, flaky crust! Add the apple mixture and dot with about a 1 tsp butter. Using new piece of parchment paper, roll out the other crust for the top of the pie. If you are using pie crust stamps, use the dough for the top crust and use as much of the dough as possible while using the stamps. For this pie, I just randomly laid out the leaves, trying to cover as much as the pie filling as possible. If you are laying on a top crust (instead of using pie stamps) just make sure to cut ventilation holes into the crust. Seriously this belongs on a magazine cover Jo-Anna. I can’t get over how stunning it is! What a beautiful pie!! 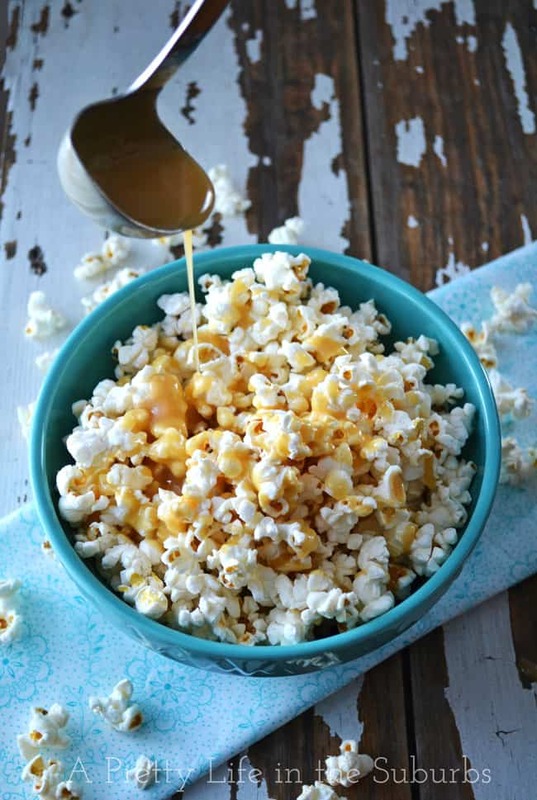 Pinned for later – definitely trying your recipe. Hi! I bought them at Michaels! I hope you find them! This looks stunning! I can’t wait to do this for thanksgiving. 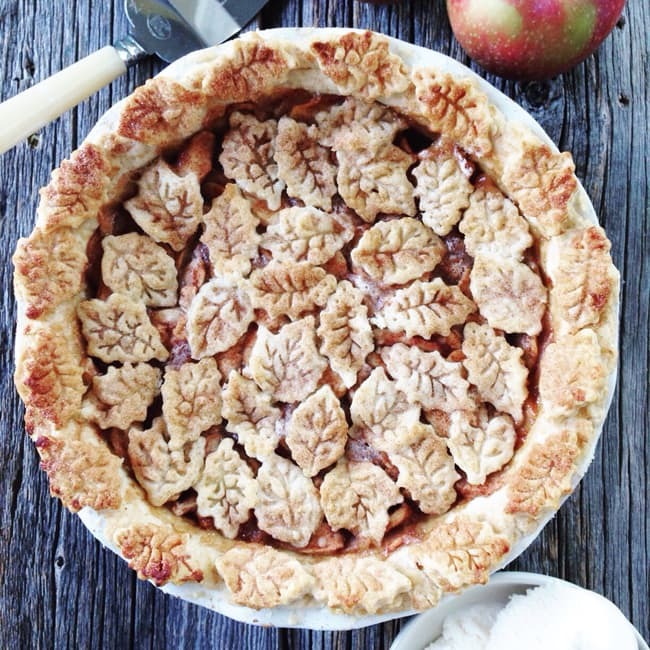 What a gorgeous looking apple pie! Pinning and thanks for sharing! The recipe sounds delicious and it looks gorgeous! How pretty this would be served for any fall dessert. Thanks for partying at Snickerdoodle. Pinned and Tweeted. This is beautiful. Thank you for joining Foodie Friends Friday. Hope to see you again next week! 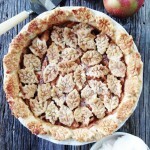 I have never seen a prettier apple pie! I love this so much that I’m featuring this post at the next Share The Wealth Sunday blog hop! I’m sharing it on my FB page as well. Thanks so much for linking up with us and have an awesome weekend! That looks way too gorgeous to eat! So gorgeous! Love the pie stamps and totally agree that I would have to get someone else to cut the pie. I wouldn’t have the courage to destroy something as pretty as this! Thanks for sharing your AMAZING pie with us at Inspire Me Monday at Create With Joy! Jo-Ann – This pie is a work of art! 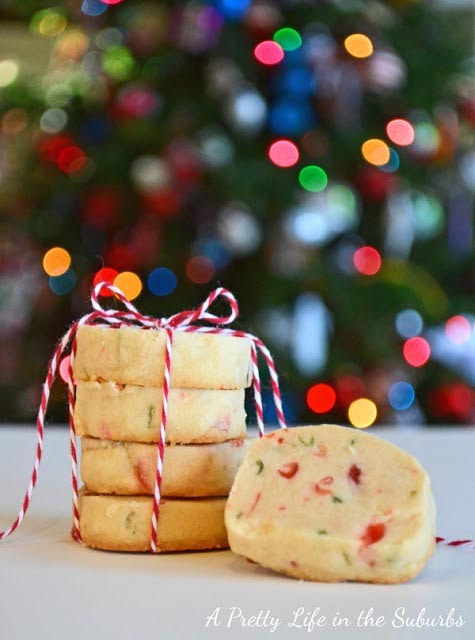 Thank you for sharing this wonderful recipe at the Thursday Favorite Things Blog Hop! You are one of my features on Tuesday Treasures. Hope to see you again this week! Wow Jo-Ann! This belongs in a magazine. SO pretty. I wish I had the patience to do something like this! Hi! 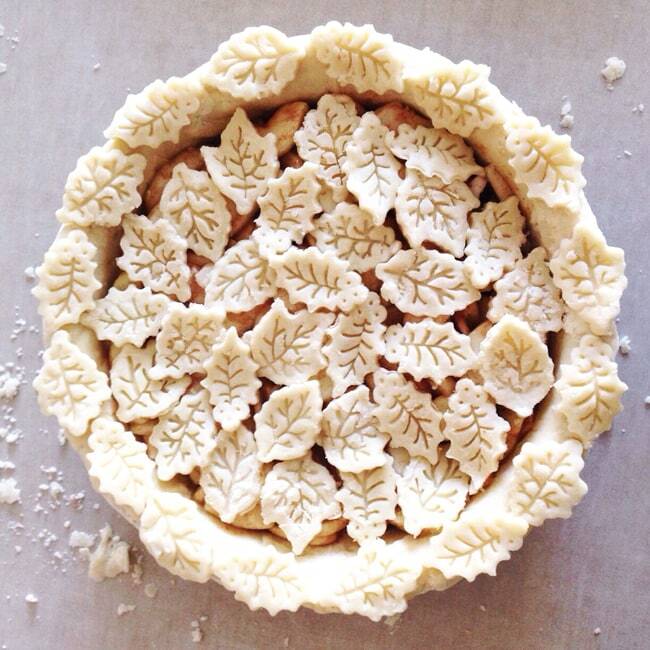 This pie is gorgeous and I’d love to make it for Thanksgiving dinner. I wanted to know if I’d be able to make it the day before and refrigerate it, before baking? Or will it get too soggy? Or can I make it in the morning, then pre-bake the pie at 425 for 20 minutes, then finish the baking before dinner? Thank you for any help you can offer!